Bishop Buckley said that he met Pope Benedict XVI on a number of occasions and was very impressed by his holiness and simplicity. These virtues were, he said, evident to all who came in contact with him. He was also, despite being one of the great theologians of our time, easily understood and remarkably clear. These qualities made him embrace the social media forums recently, including Twitter. Even since his resignation, the Chief Rabbi and others have referred to his efforts at reaching out to other religions. This was a hallmark of his Papacy. His efforts for World Peace have been recognised on an international stage by many politicians at home and abroad. He attached a huge emphasis to the fundamental questions of life that he kept before people, ‘why are we here?’ and ‘where are we going?’ These fundamental questions, he said, pervade the whole of human history. He said that we find these questions it in the Sacred writings of Israel, in the preaching of Buddha, in the writings of Confucius, in the philosophical writings of Aristotle and Plato. He regretted that these questions were being overlooked today. He often said that European Countries, which he called the ‘Heartlands of Christianity’ were sadly moving away from their Christian roots. His designation of this year as ‘The Year of Faith’ was an attempt to encourage Catholics to Celebrate, inform and share their own faith. This was, for him, the biggest challenge facing all believers. He also emphasised the role and the importance of the Priest in the life of the Church and repeatedly stated that people expect high standards of behaviour from those in whom such trust is reposed. 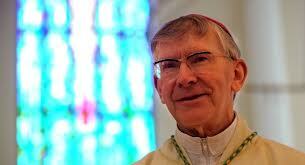 He instructed bishops around the world to ensure that there are policies in place to safeguard children. He was also responsible for a significant revision of the Church’s own disciplinary process for those who offended against children. We now have procedures in this country and in this diocese for dealing with such matters that have been proven to work very effectively. Bishop Buckley added that history will be very kind to Benedict’s Papacy and said that, like all believers, he wished him health and happiness as he lays down the burdens of Office and prepares to dedicate himself to a life of prayer in a Monastery within the Vatican.